Wllowbrook Queenstown Golf accommodation is within easy reach of 4 very picturesque golf courses (Millbrook, Arrowtown Golf Club, Kelvin Heights & Jacks Point). Indeed the surrounding Wakatipu Basin offers every conceivable form of outdoor activity, from bungy jumping to winery tours, from white water rafting to gold panning, not to mention of course, some of the most beautiful walks in the world. Millbrook Resort, set in a natural, alpine amphitheater, against the backdrop of the Remarkables mountain range is the closest course to Willowbrook Country Apartment accommodation. The golf course fully exploits the dramatic terrain & delivers world-class golf. Queenstown and the surrounding Wakatipu basin in the Southern Lakes region possess some of New Zealand's most breathtaking scenery and has a style of course to suit the desires of any keen golfer. 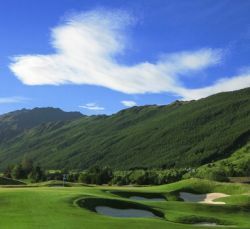 From the pristine fairways of New Zealand's first resort course at Millbrook, to the stunning Jacks Point course under the Remarkable mountain range, golf in Queenstown has become the golfers dream destination. The Queenstown Golf Club at the end of the Kelvin Peninsula is considered one of the most scenic courses in the world overlooking the beautiful Lake Wakatipu. You have the lake on three sides and the craggy Remarkables on the other, with Coronet Peak and the town behind you. Arrowtown Golf Club, alive with the ancient gold history of the area and bursting with character, and of course new private course of well known Jeweler Michael Hill ~ The Hills, home to the New Zealand Open tournament and arguably New Zealand's finest course. 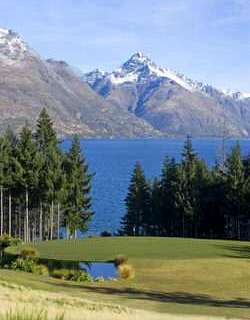 There are few places anywhere that boast as many spectacular courses as Queenstown. 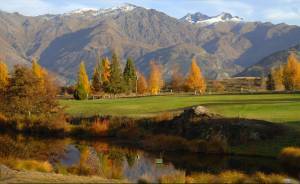 So click the link to book your Queenstown Golf Lodging. If you're travelling with a non-golfing partner we can ensure they enjoy the Queenstown experience just as much as you enjoy your golf. We are accredited booking agents for all Queenstown activities, so leave it to us and we'll take care of them too.